Rav Moshe Weinberger says that the word הלוואי contains almost the same letters as אֱלִיָּהוּ because, when we say, “Halevai such-and-such should happen”, we really have to have the same level of emunah that we do regarding our belief that Eliyahu HaNavi will be coming soon to announce Moshiach! This entry was posted in Weinberger on March 28, 2012 by Neil Harris. I recently switched jobs and my former 18 minute (each way) is now a drive of, no less, than 40 minutes each way daily. It’s taken some getting use to, but I happen to enjoy listening to shiurim and also music (90% Jewish music and 10% non-Jewish). Just last week, on RavMosheWeinberger.com, they reduced the price of shiurim credit to 99 cepts per credit and also started offering 50 downloads per month for only $6.99. That’s right, you can download 50 shiurim a month for the low price of about 14 cents a shiur. You can even roll-over unused credit to the next month. This is incredible and for me, means I can actually learn more Torah from Rav Weinberger and also catch up on a bunch of shiurim series that I’ve been hold off on purchasing. I even figured out that if I drive on the non-toll roads about 10 days out of the month, I will have actually saved the same money as I’m spending on the the monthly download fees. Of course, this means that it will take a little longer to get to work those days, but that’s more time to listen to shiurim!! 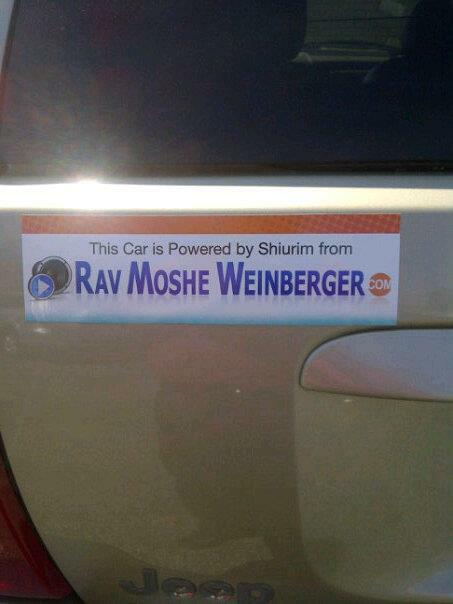 Please spread the word about this great offer and go check out RavMosheWeinberger.com. This entry was posted in mp3 shiurim, Weinberger on March 13, 2012 by Neil Harris. 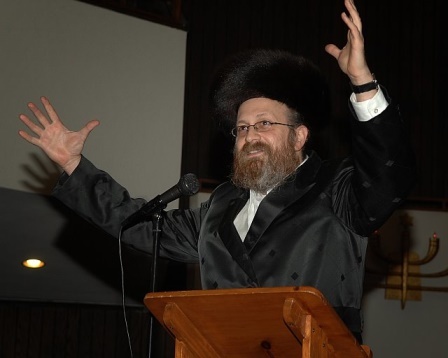 In the summer of 5760 (2000), Rav Weinberger conducted a series of special shiurim for parents seeking chizuk in that area of life that is most crucial and challenging. Using as a base text a recently published kuntres (treatise) of Rav Silverberg from Yerushalayim, Rav Weinberger teaches taht the only way to rasie inspired children is by becoming insprired parents. As in all of of his shiurim, Rav Weinberger taps into the vast reservoir of Chassidus and Machshava to take us on an exhilarating journey into the world of inspired parenting. Again, the shiurim are available for a limited time here. This entry was posted in children, chinuch, mp3 shiurim, Weinberger on February 10, 2012 by Neil Harris. Starting the Wednesday, December 14 at Ohel Shalom, 2949 West Touhy Ave, Chicago (SE corner of Touhy and Sacramento) at 8:30 is a new shiur given by Rabbi Daniel Raccah that I am very excited about. Shalom, 2949 W. Touhy. Please join us. 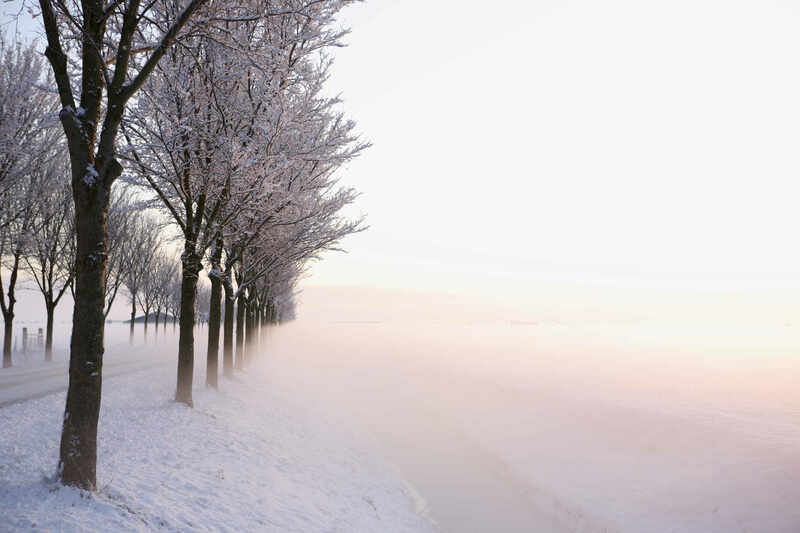 This entry was posted in Bilvavi, Chicago, Mussar, seforim, Weinberger on December 12, 2011 by Neil Harris. I recently listened to a shiur by Rav Weinberger that was given to a group of women in Waterbury, CT. I think the content, messages, and stories (the “jukim” story, the “Lost Horse”, and the “I know the Shephard” story) are similar to a shiur from 2008 posted by Dixie Yid. The shiur, titled “Chinuch & Chanukah: Chinuch with a Heart” actually starts about 50 seconds into the recording and is available here. The shiur revolves around the difference between “teaching” and “giving over” Torah. 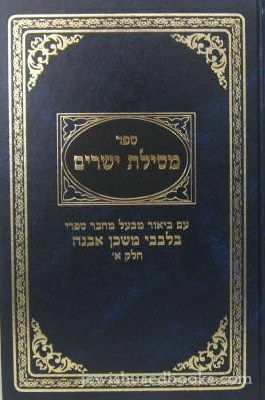 Rav Weinberger tells mentions an important article on chinuch that was published in Hakirah, The Flatbush Journal of Jewish Law and Thought by Dr. Aharon Hersh Fried. The article, titled, Is There a Disconnect between Torah Learning and Torah Living? And If So, How Can We Connect Them? A Focus on Middos is available for reading or downloading here. What follows in my transcription of Rav Weinberger telling over a story that was included in the above mentioned article. Any mistakes in writing down Rav Weinberger’s words are mine. And they were arguing and decided that they would go to the Rosh Yeshiva, which is a good thing. They went to Reb Reuven Feinstein, they went to the Rosh Yeshiva to ask him what’s the halacha then. This is what happened. Rav Reuven Feinstein was absolutly astonished by the question. Not with nachas, he was astonished. He said, “You’re learning all year since September, your learning the gemara. Everyday you have charts on the blackboard. You’re learning the gemara “Bava Metzia” that teaches that when someone borrows something he’s responsible when it breaks. If you borrow something you’re responsible.” Rav Reuven was so distrubed by this. He couldn’t understand how’s it possible that the boy, how could he not know that? That’s all they’re learning and they’re getting 100s on their tests. שואל חייב באונסין , it’s a gemara. It’s all over the gemara. If you borrow, you’re chai’ev (responsible). So, Reb Moshe said, “Because what they’ve seen in their lives has no relationship to what they’re learning in yeshiva. It’s completely irrelevant. They do not see their parents living the lives that they learn in the seforim, nor do they see it so clearly in the yeshiva.” That’s what Reb Moshe said. They would never dream of making a connection between what they learned all year and how to practically live. It might have been taught, but it wasn’t given over. This entry was posted in chinuch, Gedolim, growth, lessons, Middos, mp3 shiurim, stories, Weinberger on December 1, 2011 by Neil Harris. This is legit. Found here. 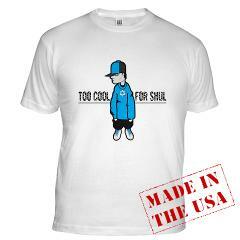 Come on, at one point we’re all too cool for shul. I’m uber-guily of this, big time! I use to like being a wandering Jew. A weekday minyan nomad, traveling along in a Jack Keroauc-like way, never really staying anywhere too long. Basing my destination on convenience and ease of parking. I was wrong. Part of my wandering was really just because I could wander. After spending almost 8 years in a one shul city (we lived in Indianapolis from 1998-2006), moving to Chicago was, well like, shul overload. Sort of like getting a shopping spree at Saint Mark’s Sounds (an excellent used cd store in NYC). I am not, Chas v’Shalom, downplaying the importance, stability, or value of the “one shul town”, but it’s refreshing to have an option (at times). Living in a city with one shul helps add a strength of community and lets you really get to know everyone, this cannot be understated (and I somewhat miss that). So, parshas Bereishis, I found myself in the social hall/basement of Rav Moshe Weinberger’s shul, Congregation Aish Kodesh, during a moving an uplifting shalosh seudos (I’ve previous blogged about the first time I was there for the holy third meal of Shabbos here[insert link]). I listened, as I heard a message that seemed tailor made for me (if you’ve heard R Weinberger in person, you often think that he’s speaking directly to you) about the importance of making an effort to daven in “our shul”, as he said. He mentioned that he knows there are many faces that he and the shul only see on Shabbos Kodesh. Not that people are not going to minyanim during the week, but it’s seems that they tend to davening elsewhere. Rav Weinberger said that he understands that people have schedules and trains to catch, but if you can figure out a way to go a minyan that not an “18 minute shacharis”, it’s better. He also said that when you make a commitment to daven in your shul you add to the kedusha of the shul. This was a very powerful idea. At that point, I decide, b’li neder, to stop being a wanderer. I have successfully made it to my shul in the mornings (except when I’ve had carpool responsibilities) and so far, for mincha or maariv. No more drifting upon the sea of shuls, I’m attempting to anchor myself, finally. This entry was posted in davening, parsha, personal, Shabbos Kodesh, Weinberger on November 4, 2011 by Neil Harris. This past Shabbos Bereishis I was at Congregation Aish Kodesh in Woodmere, NY (well, actually I was there starting on Hoshannah Rabbah and just got back very early Thursday morning) and wanted to share a small part of what remember from Rav Moshe Weinberger’s Shabbos drasha. I take all responsibility for any mistakes and lack of fully explaining any ideas given over by Rav Weinberger. 4. And Abel he too brought of the firstborn of his flocks and of their fattest, and the Lord turned to Abel and to his offering. ד וְהֶבֶל הֵבִיא גַם-הוּא מִבְּכֹרוֹת צֹאנוֹ, וּמֵחֶלְבֵהֶן; וַיִּשַׁע יְהוָה, אֶל-הֶבֶל וְאֶל-מִנְחָתוֹ. The pasuk says “Hevel haivee gam hu” to teach us that Hevel didn’t just bring his karbon, but he brought gam hu “also him[self]”, giving 100% of who he was. If you give someone a present, just to be yotzei by giving a gift, it’s isn’t as personal and meaningful as really putting thought i, ento giving someone a present, thereby giving part of yourself to another person. The greatness of Hevel was that he gave himself over to Hakodesh Baruch Hu. Much in the same way that Avraham intended for Yitzchak to be a karbon and, in fact, Chazal teach that even it was as if Yitzchak himself became the karbon. 1. I said to myself, “Come now, I will mix [wine] with joy and experience pleasure”; and behold, this too was vanity. א אָמַרְתִּי אֲנִי בְּלִבִּי, לְכָה-נָּא אֲנַסְּכָה בְשִׂמְחָה וּרְאֵה בְטוֹב; וְהִנֵּה גַם-הוּא, הָבֶל. Rav Weinberger noted that again we have almost the same loshon of gam hu havel as in the pasuk in Bereishis. If I recall correctly, we can replace “havel” with “Hevel“, and see again that we have to give of ourselves when severing Hashem. with joy and pleasure. He concluded by saying that a person can spend those 51 days between Rosh Chodesh Elul and Hoshannah Rabbah going those the actions offering up karbonos of Selichos, mikvah, teshuva, davening, mussaf, al chaits, living in the sukkah, saying hallel, shaking our lulavim and esrogim, and performing hoshannos, but if we are not prepared to fully give ourselves, “gam hu“, then it’s as if we aregive a present in a haft-hearted way and not fully giving a karbon to Hashem in the most beautiful way possible. We each have to give of ourselves to Hashem. That’s what he wants from us. This entry was posted in Avodas Hashem, Elul, parsha, Weinberger on October 28, 2011 by Neil Harris.